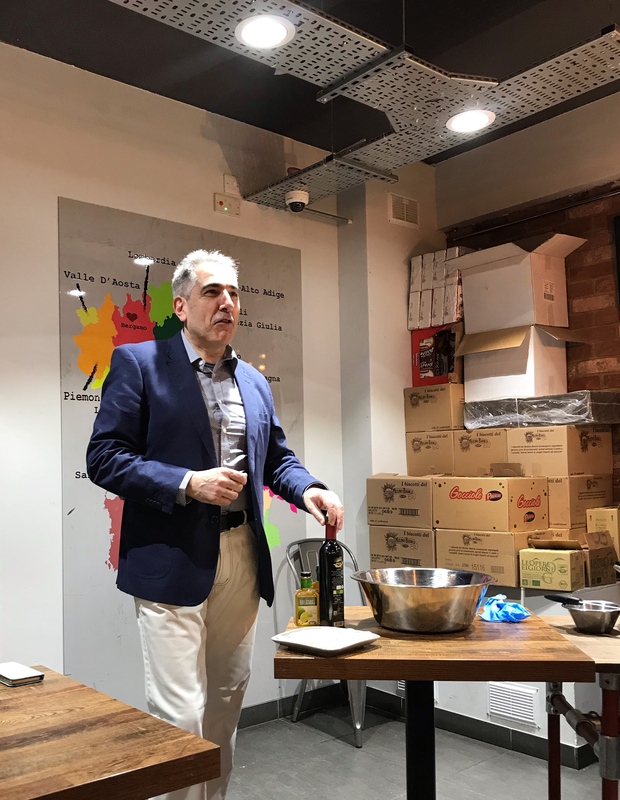 Francesco of Agrumia spoke about the high quality extra-virgin olives oils, including infused ones from Le Opere e i Giorni, which were drizzled on ricotta, mozzarella and focaccia. 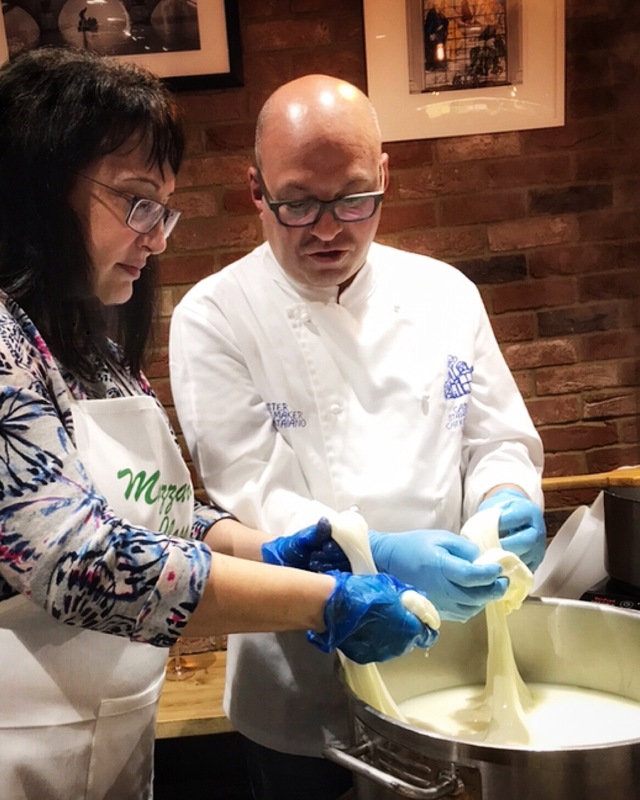 We took turns in groups of 10 to learn Biagio’s technique for making mozzarella whilst Francesco offered tasters of the incredible cheeses from Caseificio Staiano – ricotta and stuffed caciocavallo. 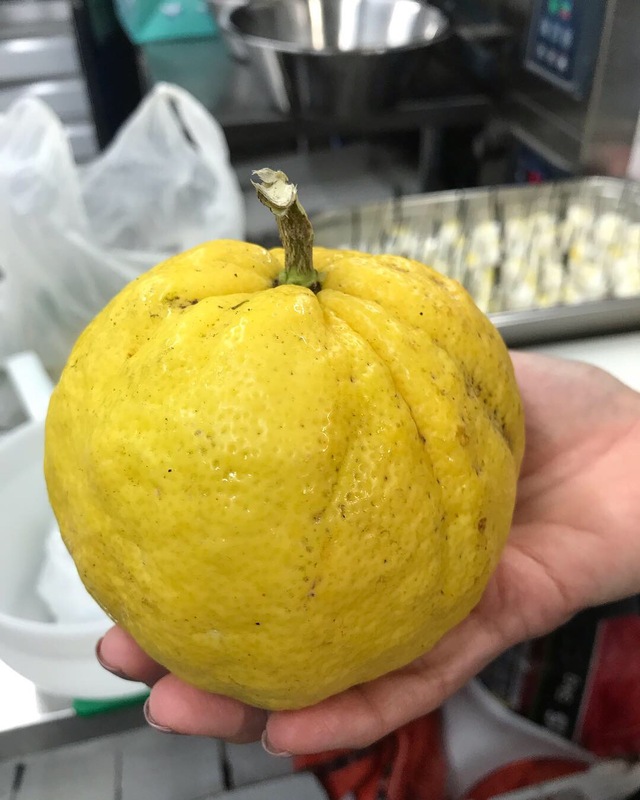 Biagio brought the most vibrant lemons from the Amalfi Coast. 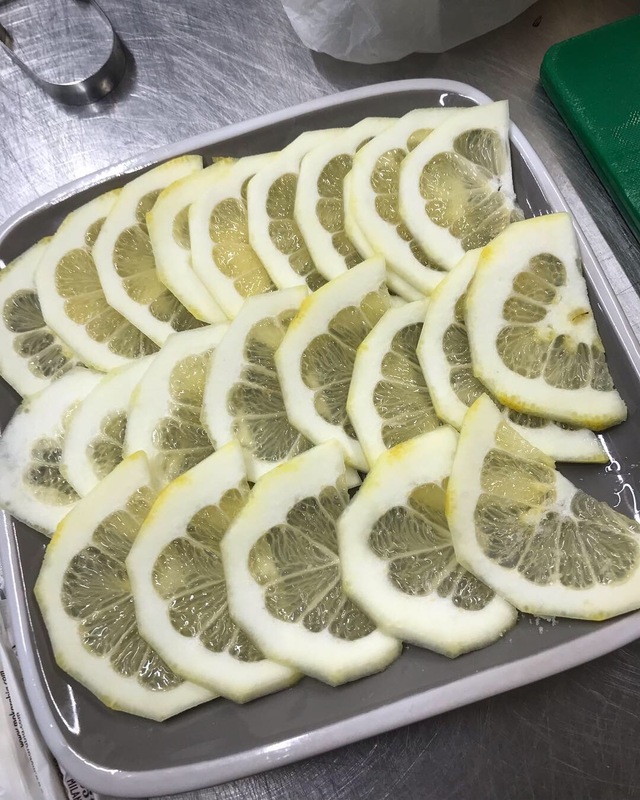 They were thinly sliced so you could eat them, rind and all. Some of the other rinds were chopped and sprinkled over the ricotta. What a taste sensation! 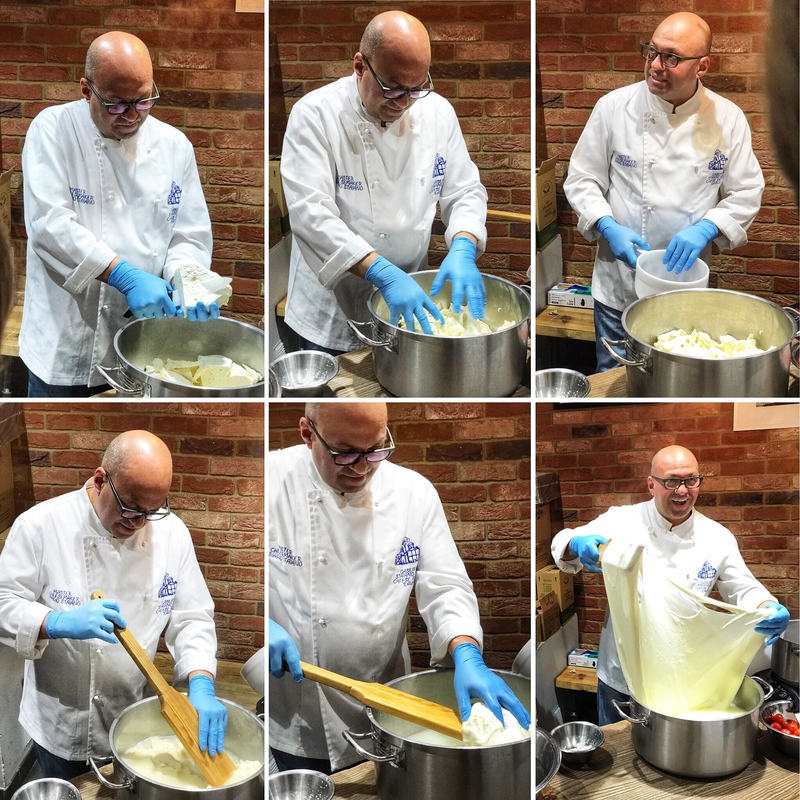 For the mozzarella class, we put on our aprons and gloves and gathered around a table. 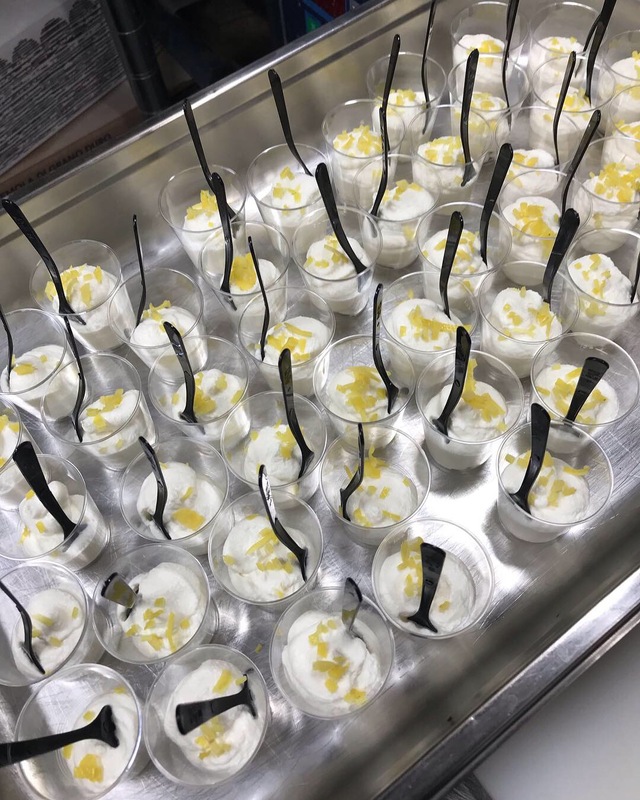 Karolina gave a brief introduction and explained that the curd was freshly made ahead of time with the region’s local milk and rennet. 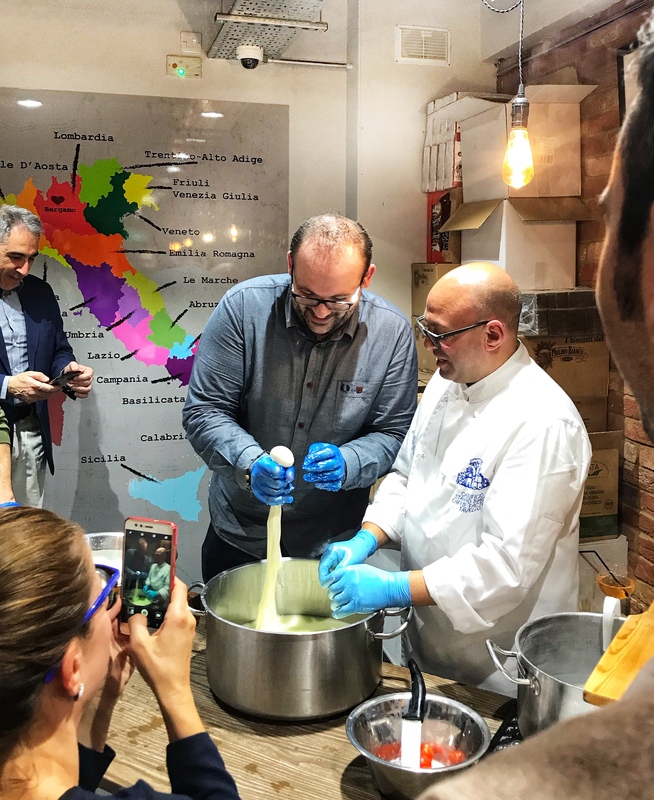 Biagio proceeded to break up the curd in a large bowl then poured hot water over it, stirring with a wooden paddle until the curd was ready to be stretched. 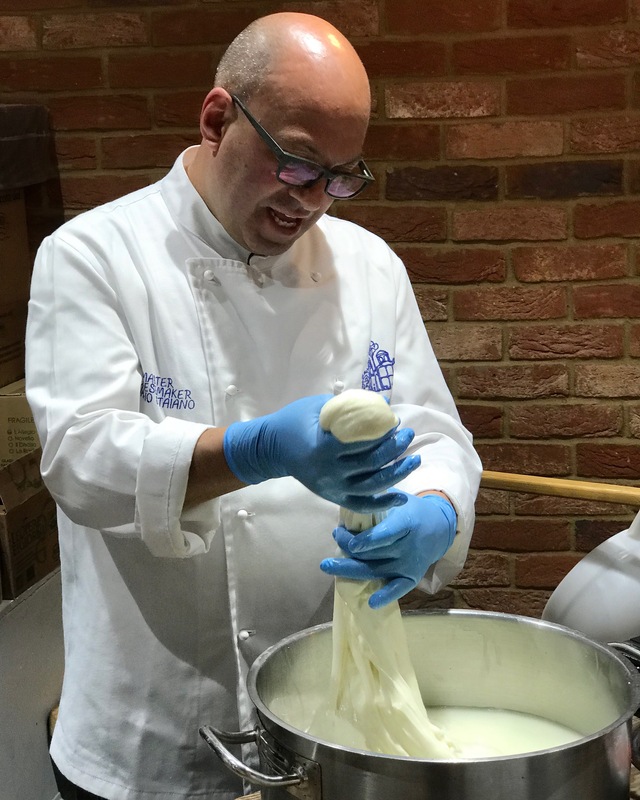 With his expert technique, Biagio then used the paddle to stretch the curd until smooth and elastic. 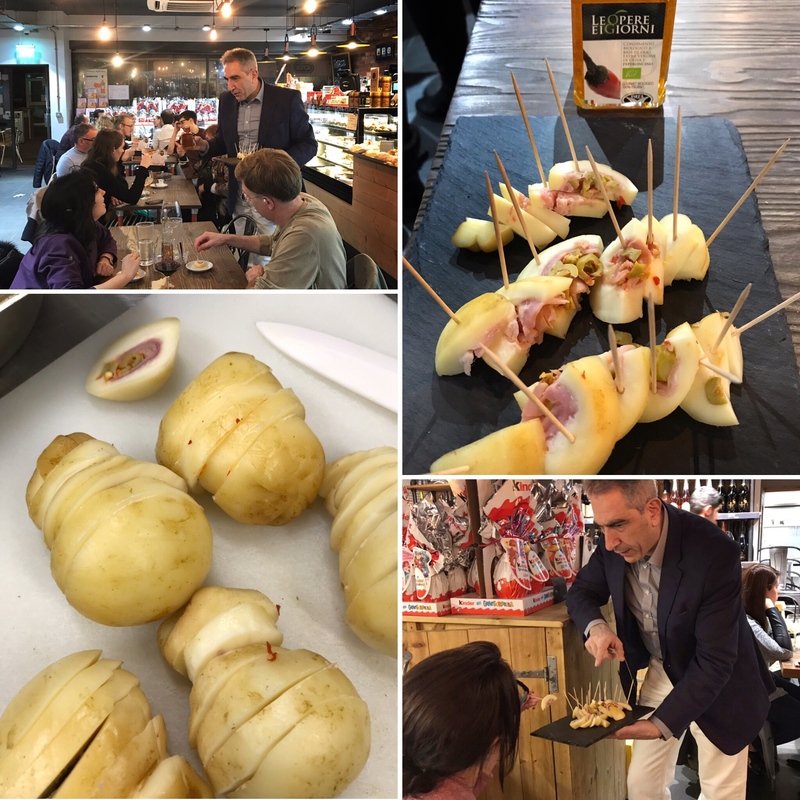 A sight to behold – we could see the cheese come to life! Lifting and stretching the curd gave it its stringy texture, which meant the cheese was ready to be shaped. 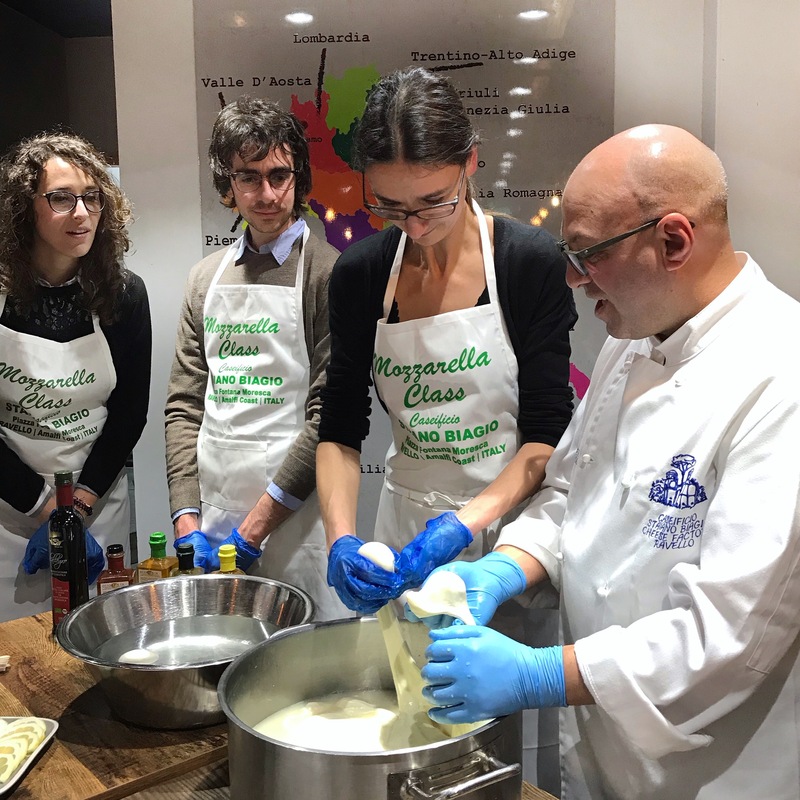 This is where each participant got involved and made their own ball of mozzarella, under the expert guidance of Biagio. Even Alex got in on the action! 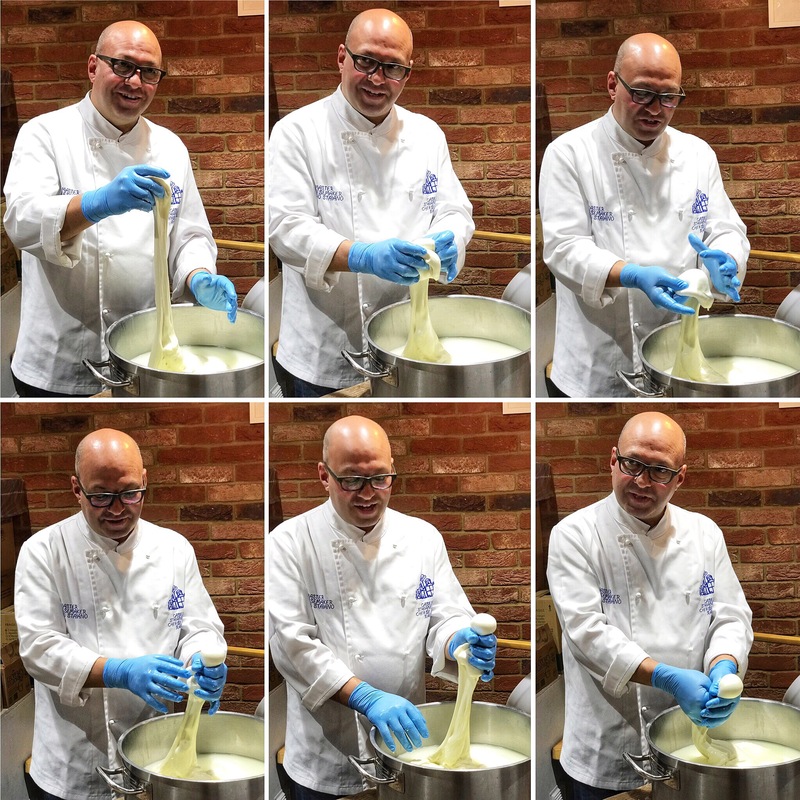 We practiced the technique of tucking and folding to turn the string of cheese into a ball, making it round and smooth, closing it (almost strangling it) then pinching it loose. The final pinch was the hardest part for me and I can now understand why it’s crucial to master the technique, because if you break or tear the bottom of the ball it will look like a jellyfish. 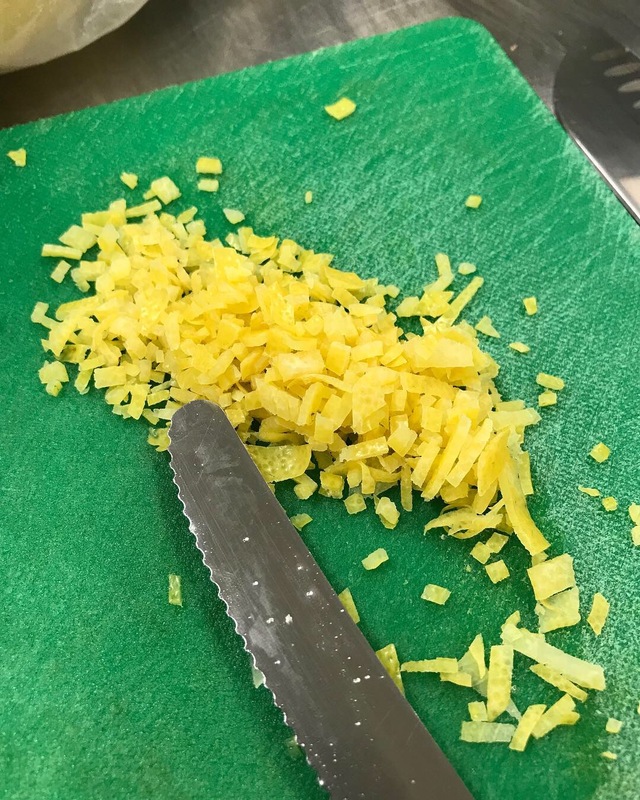 After all, “mozza” is Italian for “pinch” and if the cheese is named after this word, it means you need to get the technique right. 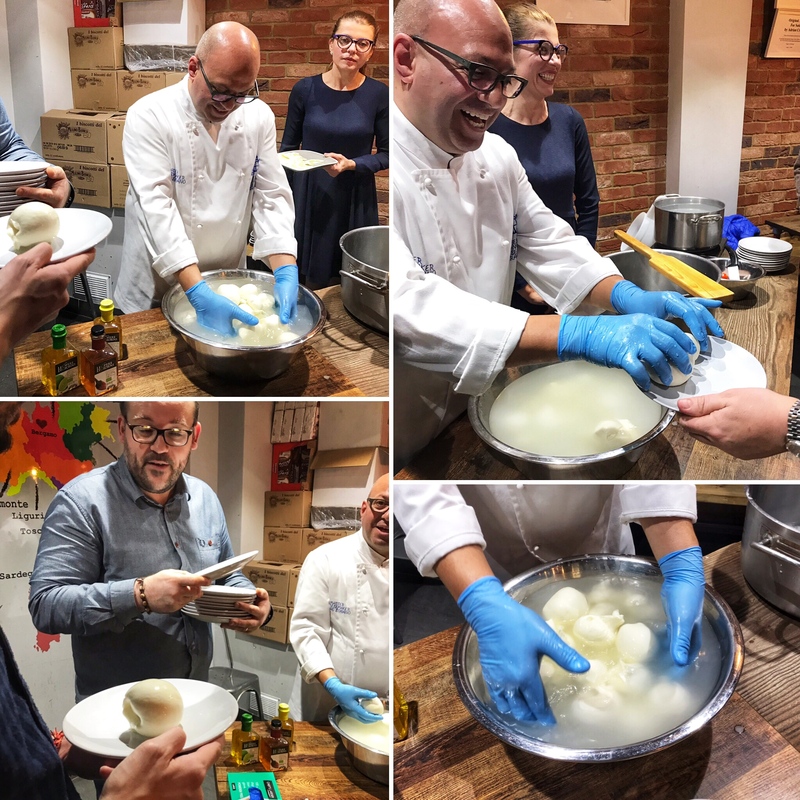 Biagio can actually do this with his eyes closed, and I love how he snuck in a tomato into the ball of mozzarella. Watch below – blink and you’ll miss it! 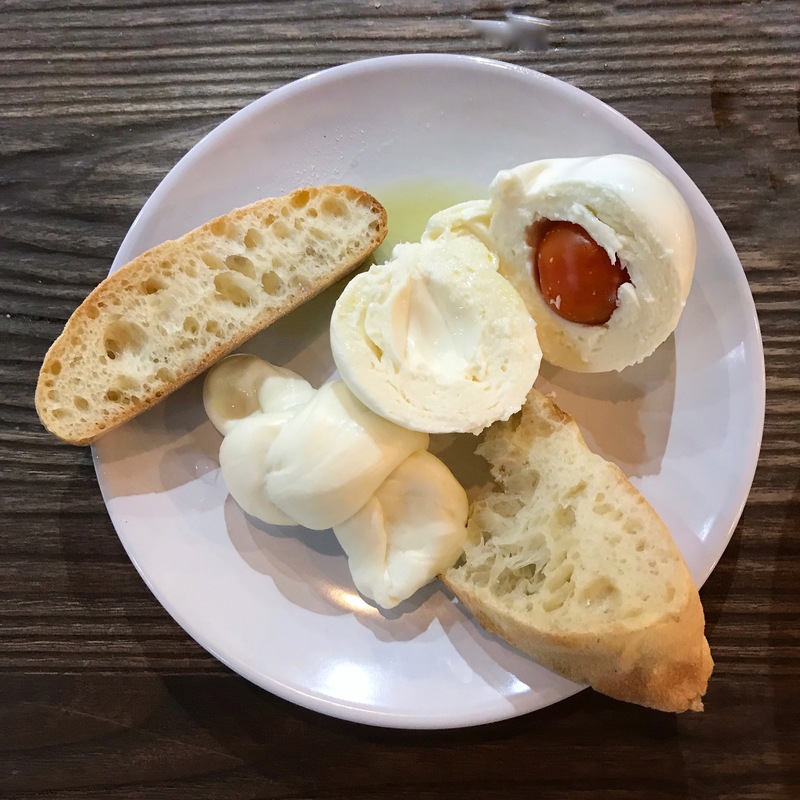 Our homemade mozzarella was then served for us to enjoy, along with bread and our choice of olive oils. 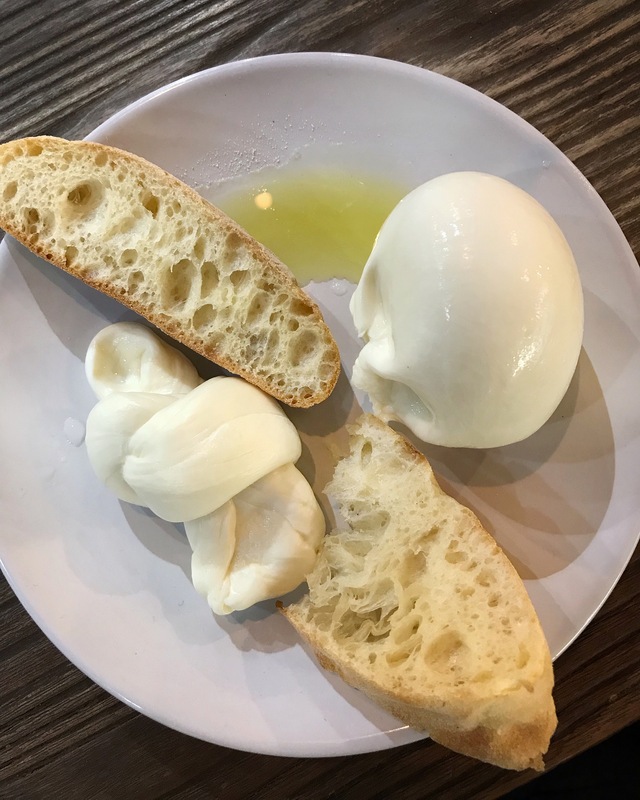 We were told that the mozzarella would be tougher as it was freshly made but it still was amazing. 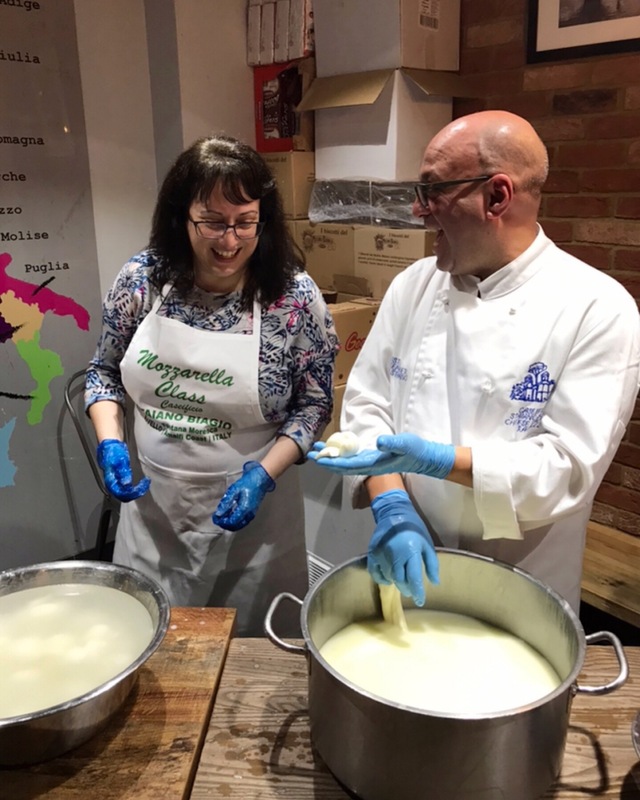 We were all given more mozzarella to take home, packed in a bag filled with water. I had it the next day and it was beautifully soft and milky. 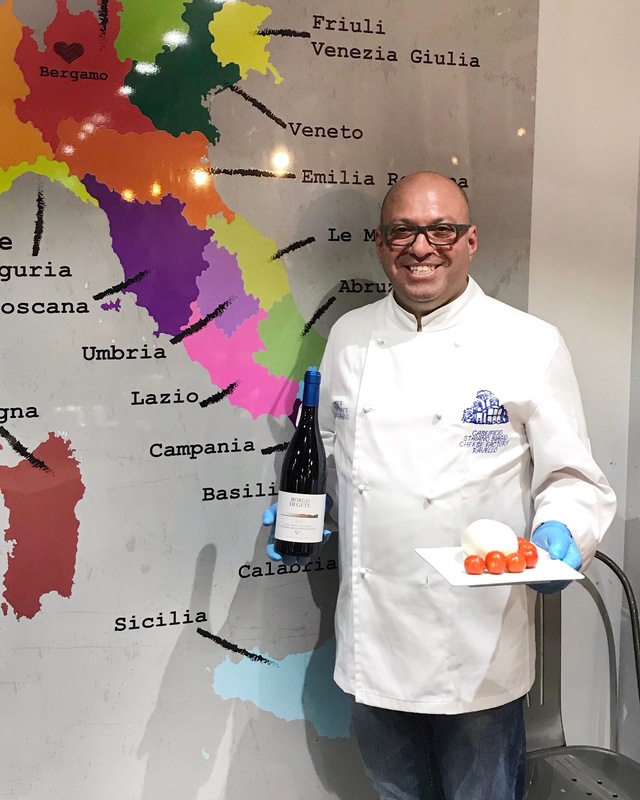 What a treat to have this authentic taste of Italy, specifically from the Campania region. 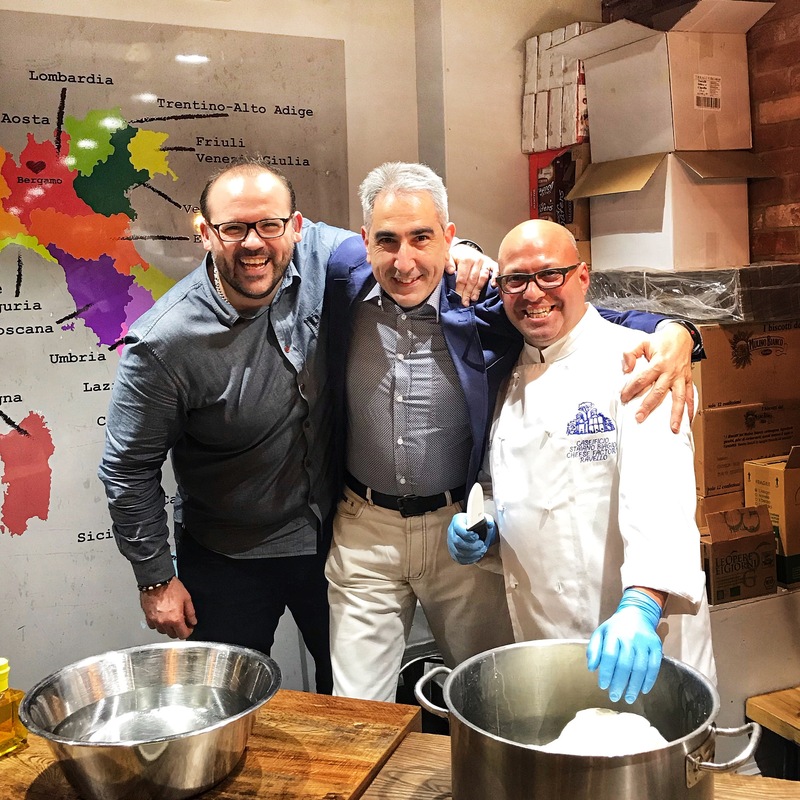 It was an honour to learn from Biagio Staiano himself, such an accomplished expert cheesemaker. Even with his limited English he smiled and went through the process with every single participant. He made the class so much fun and patiently answered any questions. His wife Karolina was a great interpreter with impeccable English. I hope they will return to Cambridge and do it all again. I might not be able to wait that long and find myself booking a flight to Ravello. 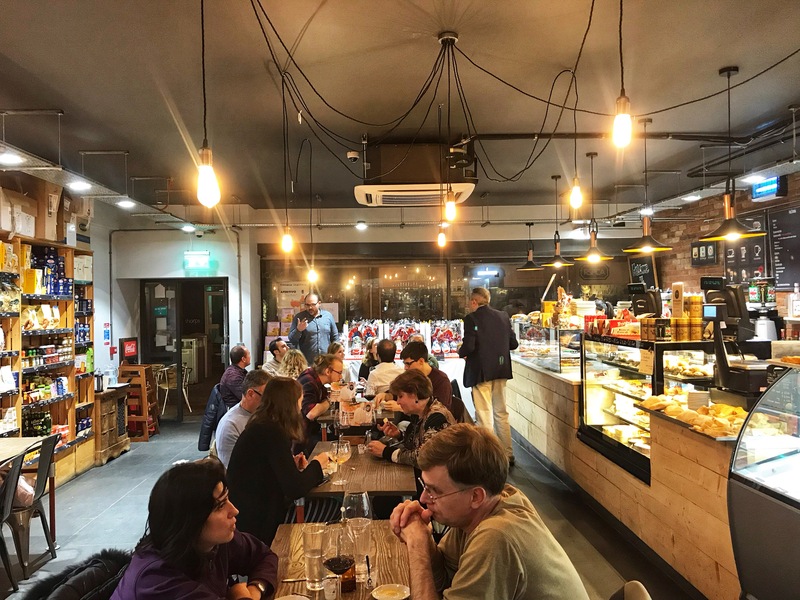 Mmmmm… gorgeous cheese! 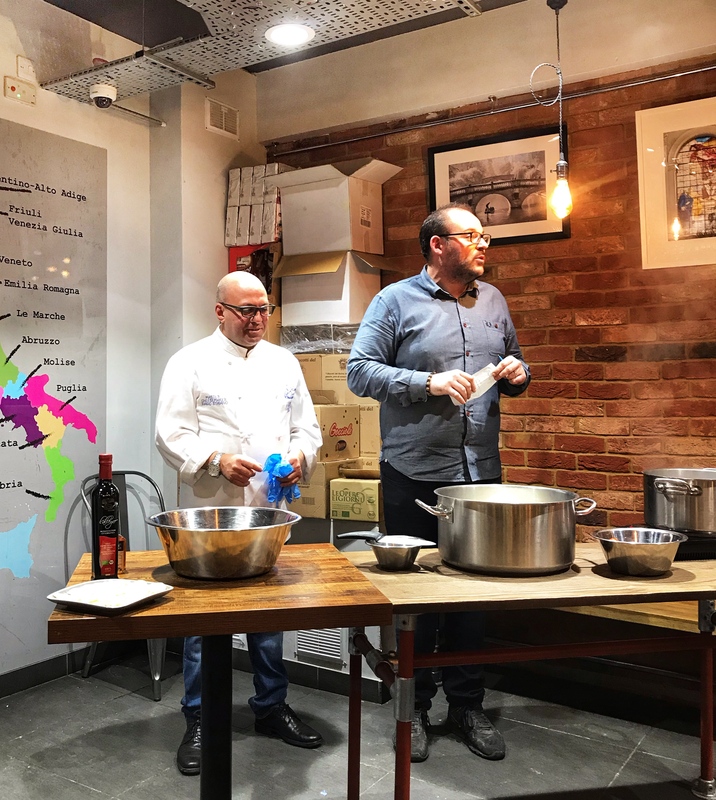 A big thank you to Francesco, Alex, Biagio and Karolina for making this such a wonderful experience. 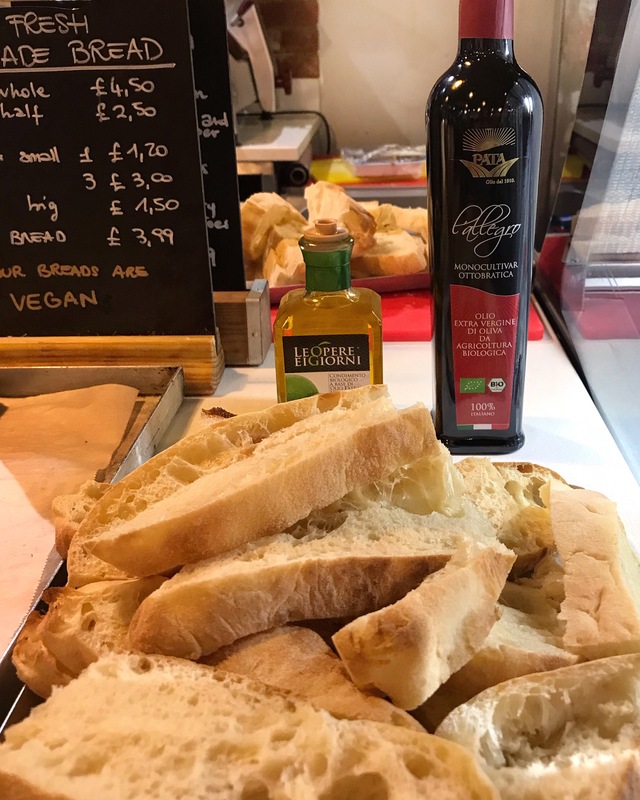 Those who have been to Signorelli’s Deli before know that their events are always sociable (and delicious) so keep an eye on their Facebook (and my social media) for any future developments. I was invited to attend the class. Although it was complimentary, all views are my own. I did not receive compensation for my blog post. 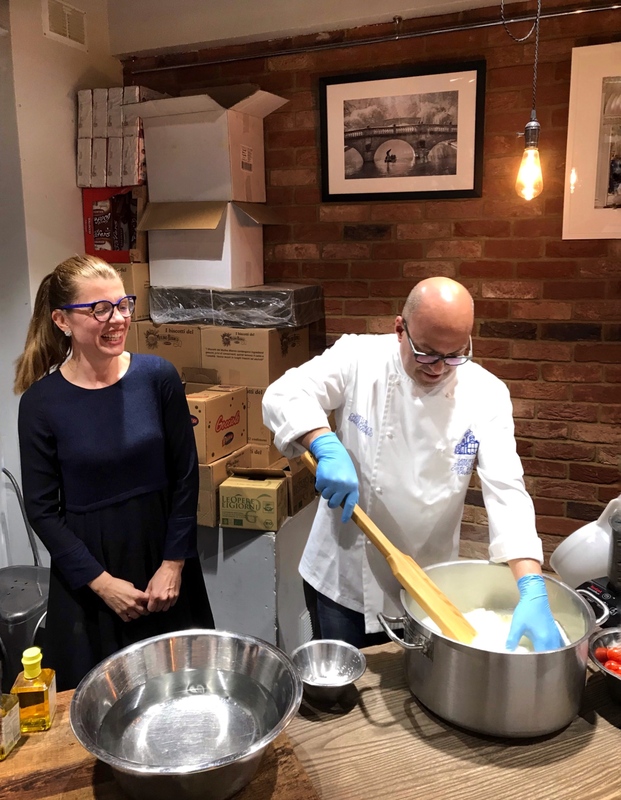 This entry was posted in Food Events and tagged Agrumia, Alex Signorelli, Amalfi Coast lemons, Biagio Staiano, Cambridge, Caseificio Staiano, Francesco Amato, lemon, mozzarella, Mozzarella Class, ricotta, Signorelli's Deli, stuffed caciocavallo by One Two Culinary Stew. Bookmark the permalink. 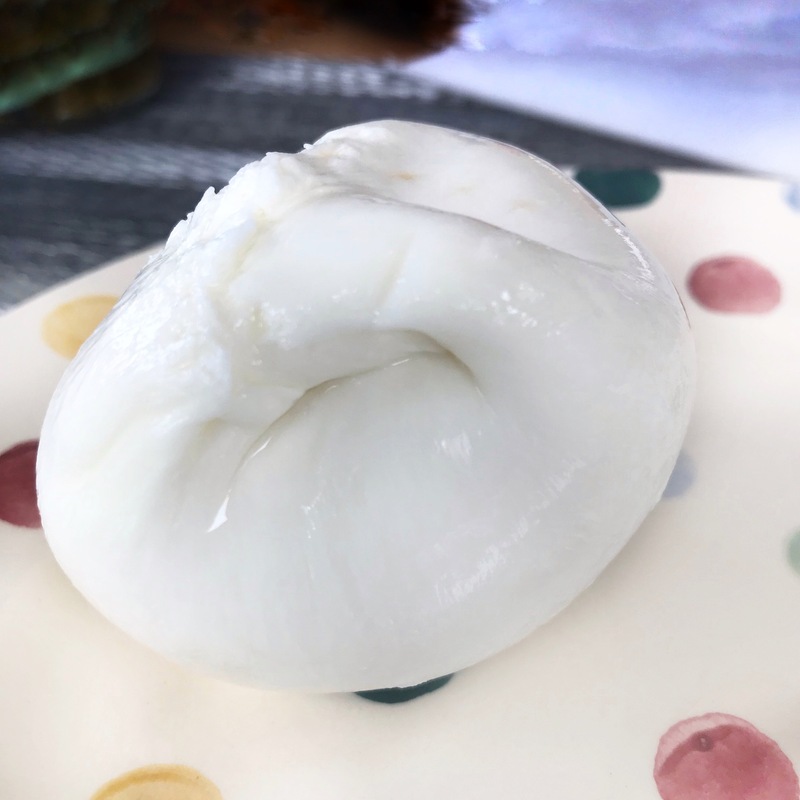 I’ve never made mozzarella before but it looks delicious and so much better homemade. You must try it next time. It’s fun!